2 matches in 1 day? Discussion in 'Cardiff City Forum' started by Nugent, 6 Nov 2018. No problem for Mark Hughes. Wales and bayern in the same night. Pansies wouldn't do that now. The pansies would probably try and get you arrested for offending them with such a suggestion if you don't mind me saying so Nuge. Different breed mun. The barber used to go through 3-4 pairs of scissors just trying to tame that mullet. In the end special scissors were forged from Samurai swords and Excalibur to do the job. His first name is Leslie as well. He made that name tough again. I doubt if he has managed 3 wanks in an hour, so I'm all "Meh" about this story. 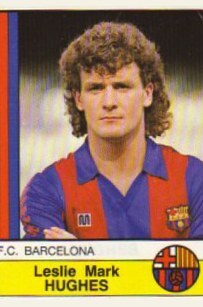 Panini used his full name in Spain.